Several issues required immediate attention. Problems included periodontal disease, some hopeless teeth, cavities, failing restorations and cosmetic concerns. An insufficient bony foundation made bone grafts necessary to support implants. 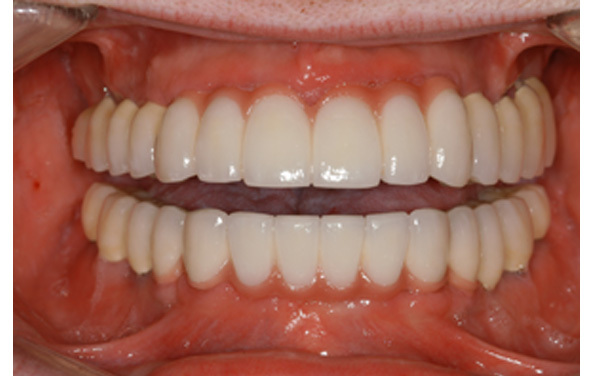 A brighter and straighter smile restored both beauty and confidence. Periodontal surgery, extractions, bone grafting and implant placement surgeries were completed. 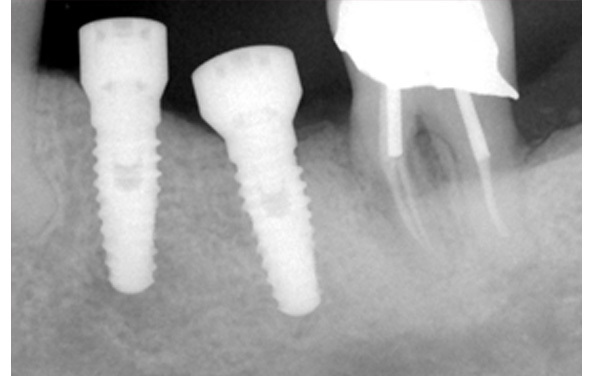 Then, custom abutments were attached to each implant. 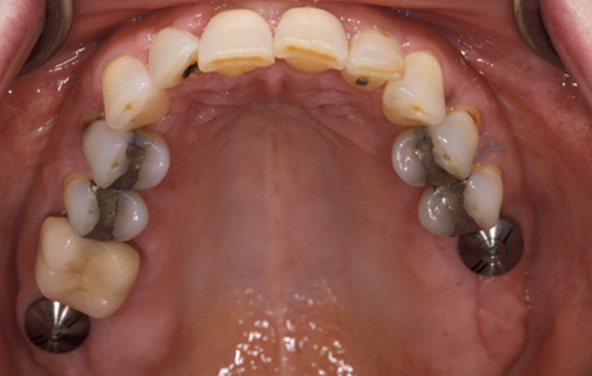 Lastly, porcelain crowns were made and cemented to all teeth and implants. This patient came to our office in pain, with failing dental work and many hopeless teeth. She needed to have extractions of all her upper teeth and her lower posterior teeth. We reconstructed her mouth using dental implants and crowns. Treatment began with extraction of all hopeless teeth, sinus lift procedures and insertion of temporary appliances. 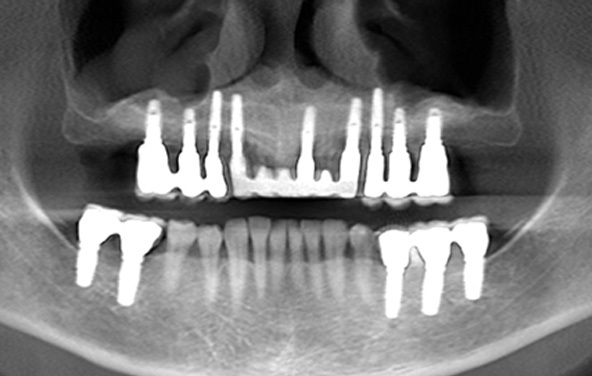 Then, i-CAT scans and computer-generated surgical guides allowed precise placement of 14 dental implants. 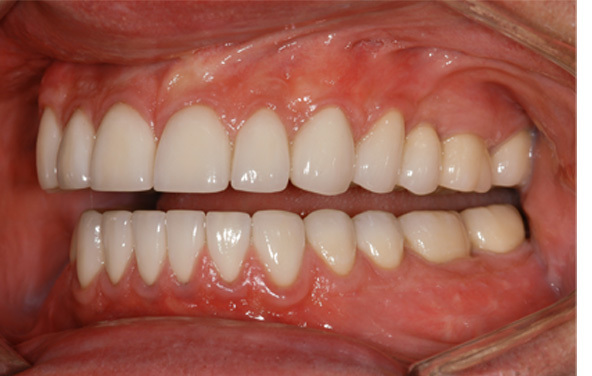 Our patient was thrilled that she did not need dentures and marveled that her new teeth looked and felt natural. This successful attorney had long neglected his teeth. Two teeth were hopeless and required extractions. Although he felt no discomfort, he realized that his grinding habits had caused chipping, wear and failing restorations. 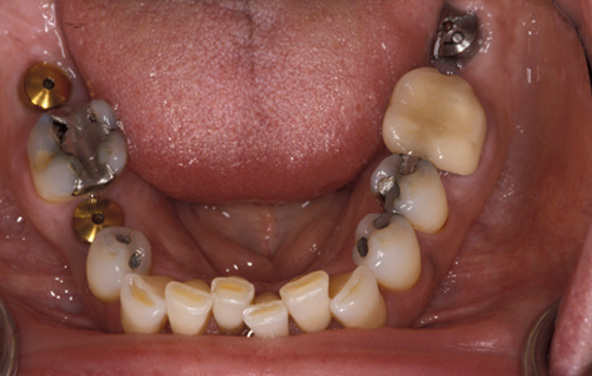 Titanium implants replaced hopeless teeth, and porcelain crowns were made to reconstruct his bite and function. The results were so striking, he wished he had the procedures done sooner. 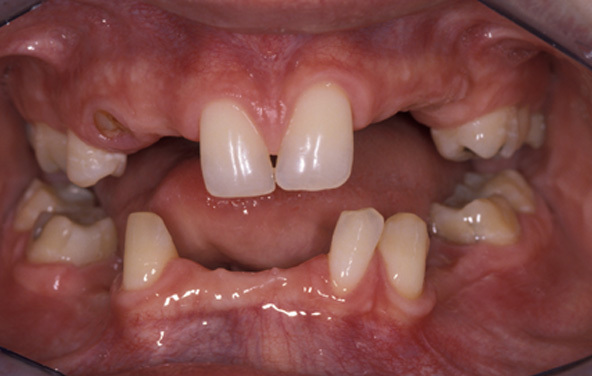 This young man never developed a complete permanent dentition, and the few teeth he had were in the wrong positions. He did not like his smile, was tired of partial dentures and came to our office looking for solutions. This complex reconstruction required a team approach. 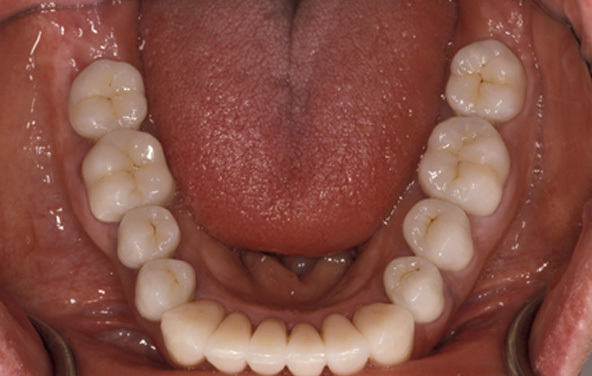 An orthodontist and oral surgeon were needed to align his teeth and jaws. Ten implants replaced missing teeth before we made crowns and bridges to reconstruct his smile. This handsome patient was very grateful, and we found it satisfying to help him achieve a smile he never thought was possible. This patient and his wife were unhappy with his smile. He thought there was no hope, but she thought we could help. 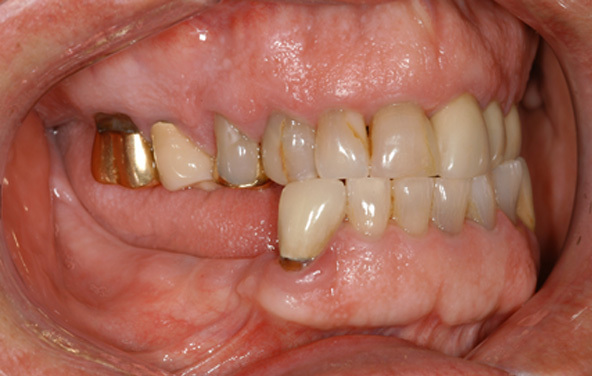 For many years, he had tolerated uncomfortable partial dentures, a bad bite, worn and missing teeth, and discolored restorations. 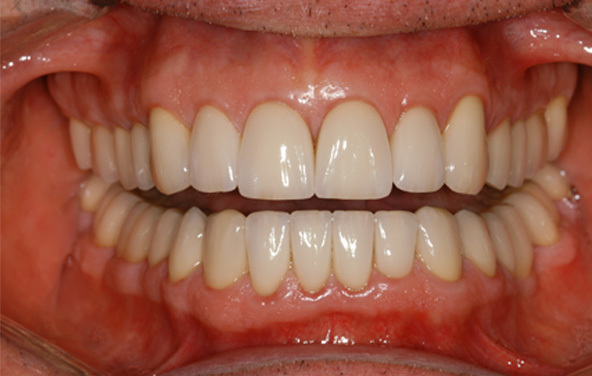 Periodontal surgery was necessary to improve the health of his gums and to make the gum line more even. A sinus lift was also necessary to increase the strength and thickness of supporting bone for implant placement. We then replaced his missing teeth with nine dental implants. 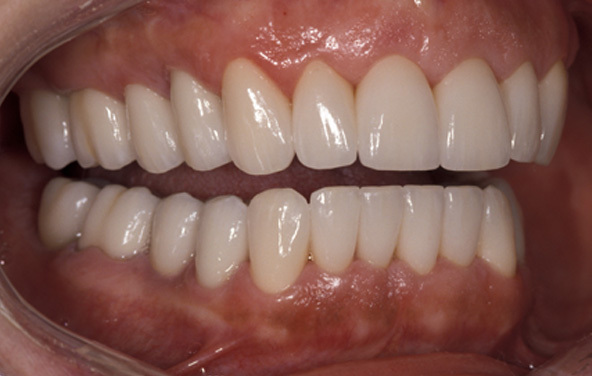 Lastly, individual crowns restored all remaining teeth and implants. Our patient and his wife were beyond thrilled with the end result. 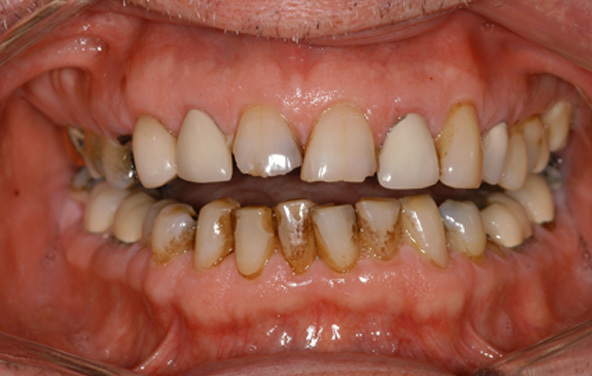 This case addressed multiple major dental health issues. 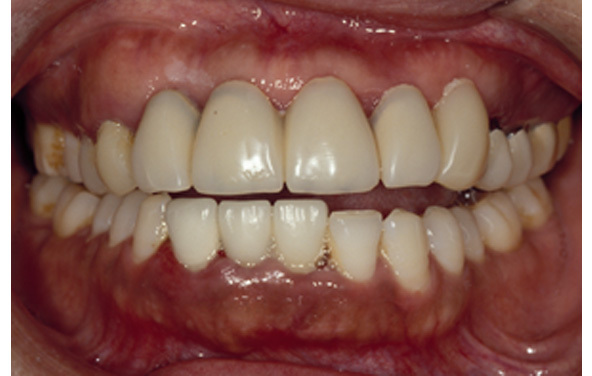 At this stage of treatment, this patient had already received periodontal surgery and three dental implants. A host of serious problems remained, including cavities, failing restorations and crowding. Crowded teeth were straightened using restorations. Abutments were attached to implants. 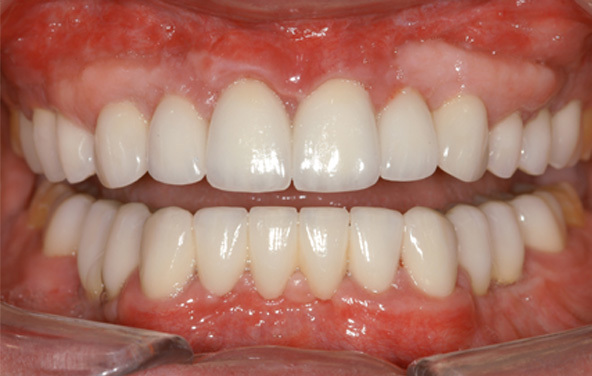 Then, porcelain crowns were fabricated and cemented onto all implant abutments and teeth. 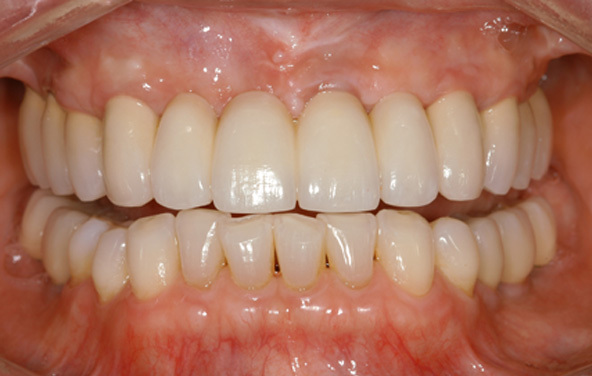 This beautiful, functional reconstruction looks and feels just like attractive natural teeth. This patient had several serious problems. Her issues included cavities, heavy wear of her front teeth, cracked teeth and failing restorations. 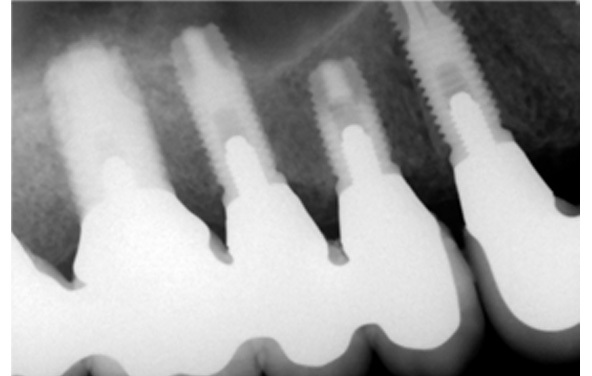 Inadequate bone support required bone grafts prior to placement of two implants. 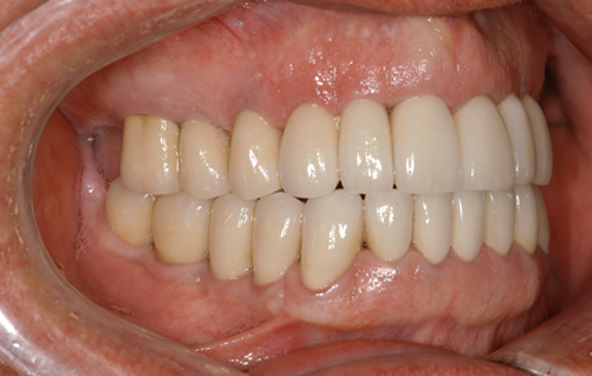 Implant abutments and porcelain crowns completed this reconstruction. These methods and materials are far more superior to treating with partial dentures and silver/mercury fillings. She not only has a restoration that looks and feels natural, but her result is exceptionally strong and durable. 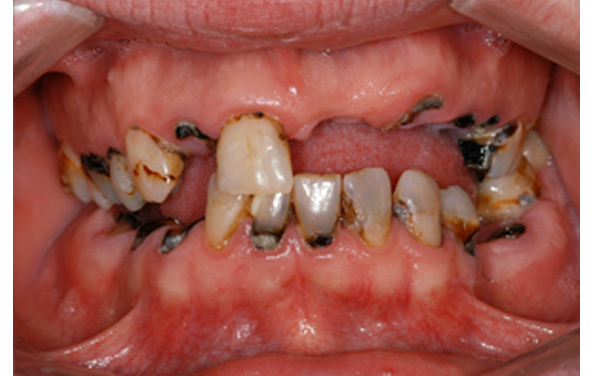 This young man had serious dental problems resulting from years of neglect. He had no other choice than to get all of his teeth extracted, but he did not want to have dentures. His reconstruction required many elements. All teeth were extracted, and sinus lifts were completed. 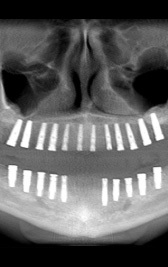 Then, i-CAT scans and computer-generated surgical guides allowed precise placement of 22 implants. Porcelain crowns and bridges were the final phase of the reconstruction. Our happy patient expressed gratitude for the dramatic change we made in his life. 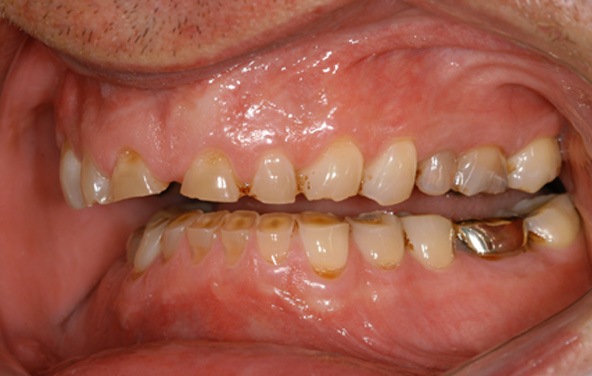 This patient did not like his smile and complained of an uncomfortable bite. He had a severe grinding habit that had caused extreme wear on all of his teeth, some of which were almost worn down to the gum line. Two teeth were hopeless and required extraction. This complex treatment required a team approach. An orthodontist and oral surgeon were needed to correctly position his teeth and jaws. Then, we placed two implants, completed gum surgery and placed porcelain restorations on implants and all remaining teeth. The result looks great, and our patient finds his new bite to be much more comfortable than before. 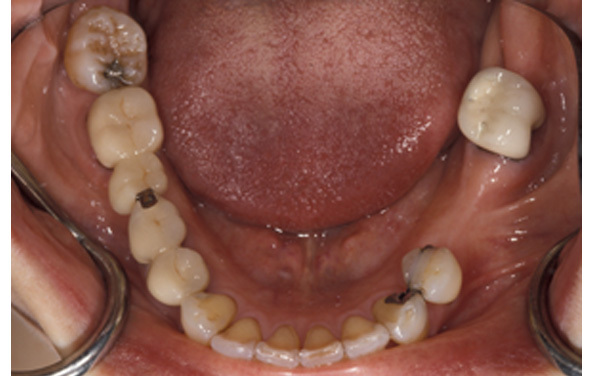 This patient needed extensive dental treatment to restore the teeth of her lower jaw. 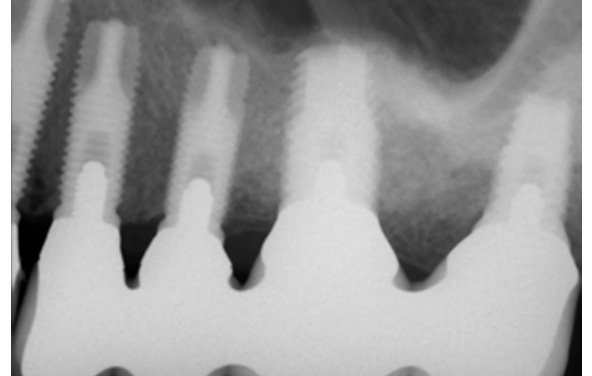 X-ray: Her lower left molar could not support a bridge. Two implants replaced her missing teeth. 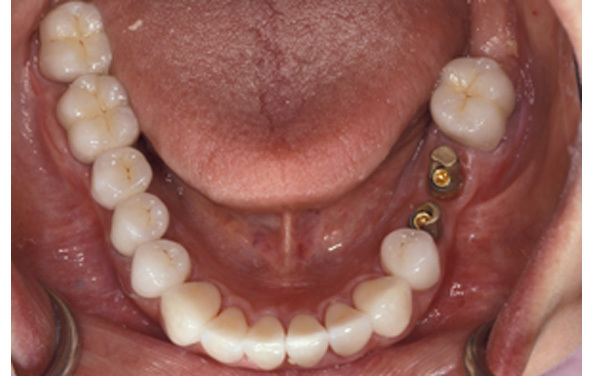 Gold abutments were made to fit the implants and support the overlying crowns. 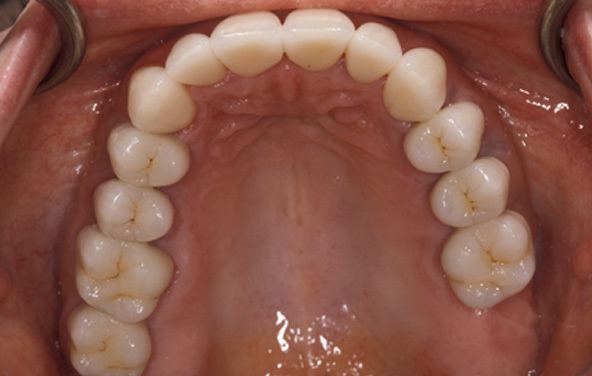 Crowns were cemented on all teeth and implants, resulting in a beautiful reconstruction. 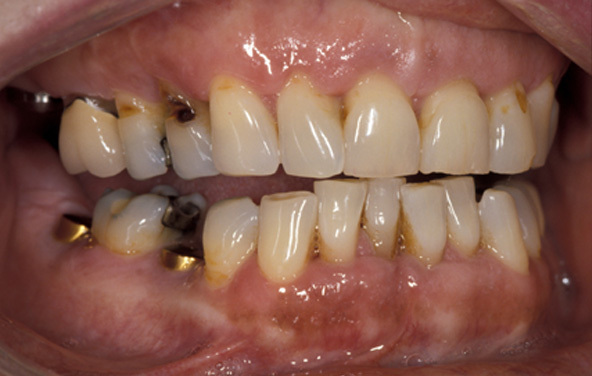 This patient had multiple problems with her teeth. 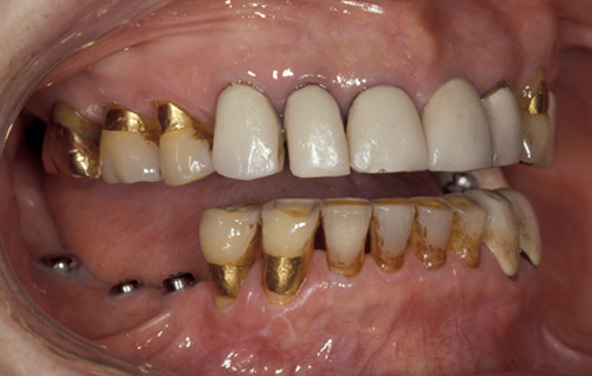 Cosmetic concerns, missing teeth and many failing restorations were her primary issues. In addition, a severe grinding habit had resulted in heavy wear and loose teeth. In a collaborative effort, she received orthodontic, periodontal and implant treatment before referral to our office for restorations. A stable and functional result with the appearance and feel of natural teeth. 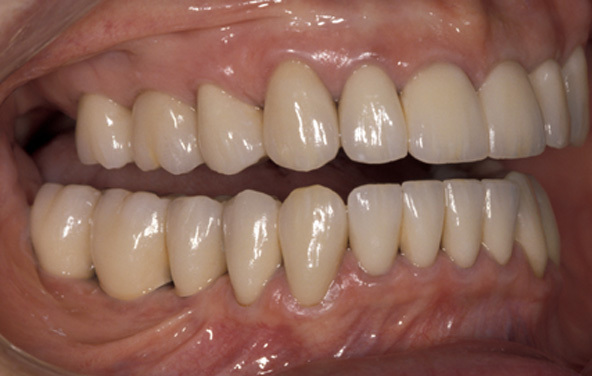 Metal-ceramic crowns were fabricated and permanently cemented on all teeth and implants. 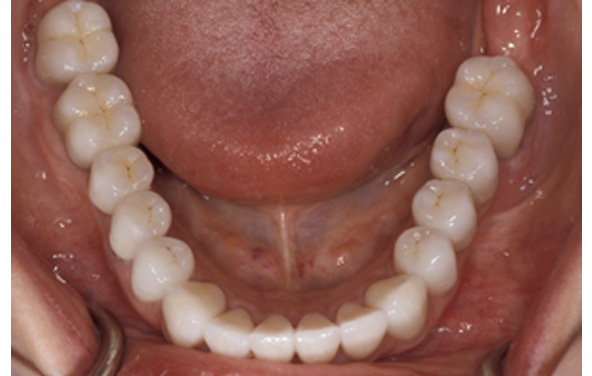 Some crowns were splinted together to provide additional support for her weak and mobile teeth. With a history of periodontal disease, and consultations from other dentists, this patient knew she needed to have all her upper teeth extracted. She desperately wanted to avoid dentures and came to our office interested in dental implants. 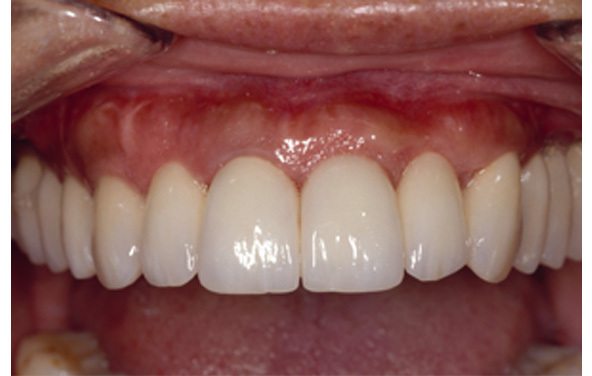 A reconstruction of her smile was accomplished using a staged-implant approach. By placing only a few implants at a time, she never needed dentures and could manage costs. Once all 13 implants were in place, temporary restorations were converted to permanent crowns and bridges. When the reconstruction was completed, our patient had a healthy, comfortable and pretty smile.